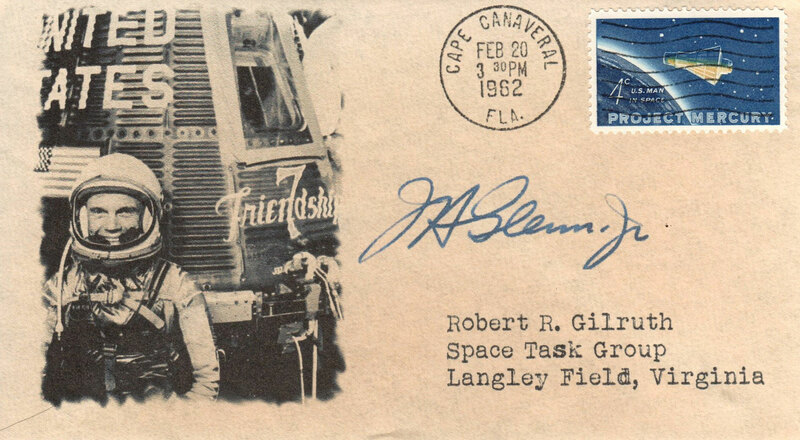 This vintage envelope with a real stamp is sold on eBay as a replica. The offering says so but nowhere on the merchandise. To the untrained eye (or even a semi-trained one) it looks pretty genuine. The circle date stamp and signature look decent. The customized addressee is whoever you want. I picked Gilruth but I probably should have picked Shade, Riser or Flick. The seller handles the postmark a number of ways. Sometimes without a year, sometimes with crowded and easy to spot lettering, and sometimes reproducing a previously created one. I plan to contact eBay. It is quite silly to fabricate the cancellation as there is no shortage of clean, vintage, unaddressed FDCs from the Cape on eBay for $1 or less. Agreed. That said they also offer repros of Neil Armstrong, the Apollo 1 crew, etc., on vintage paper. Their repro Hancock cut square is on paper from 1770. Once it passes through a hand or two (or estate sale) we will be sorry we didn't say anything.